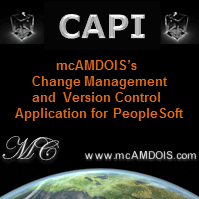 we are in the process of integrating CRM-Peoplesoft for customer and project ID generation. From peoplesoft we are providing the CRM team, CI Based WSDL and the data is captured at the peoplesoft and CUSTOMER and PROJECT ID's are generated based on the input recieved. Now the CRM team needs the generated CUSTOMER ID and PROJECT ID created at peoplesoft end. can anyone help me out , how we can send the generated ID's back to CRM once it generated at PeopleSoft? Thanks in advance and all your help is much appreciated. What if the generated customer ID and project ID are provided through another web service?